PicoWay Zoom is the world’s most powerful Picosecond Laser for pigment correction and is now available at Vamp Cosmetic Clinic in Newcastle. Skin pigmentation is a natural process that occurs due to environmental factors like sun exposure and hormonal factors as we age and during pregnancy, and some are natural birth conditions. Pigmentation is a very common problem in men and women of all age groups and can contribute to a person looking aged prematurely. Vamp Cosmetic Clinic offers advanced pigment correction using the PicoWay Zoom. The PicoWay is the latest generation Picosecond laser skin pigmentation removal device. 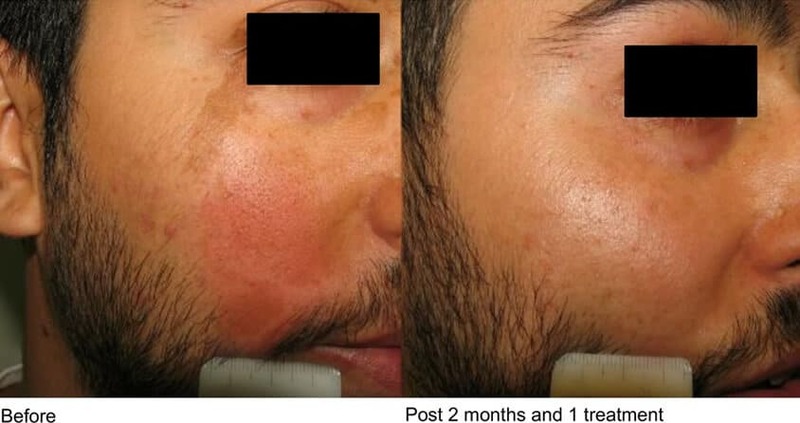 It treats skin pigmentation such as age spots (brown spots), freckles, birth marks, pigmented scarring, melasma, in all skin types (including darker skin types IV and V) in the shortest time possible, with next to no heat making it much more comfortable than other lasers with virtually no downtime. View our Gallery for Before & After photos. HOW IS PICOWAY RESOLVE DIFFERENT FROM OTHER LASER SKIN REJUVENATION TREATMENTS? The PicoWay has the shortest picosecond pulses (40-50% shorter) than other picosecond laser systems which means it’s highly effective and lower risk than other devices. It uses photoacoustic energy rather than heat to shatter pigment into minuscule fragments which are absorbed by the body achieving faster clearance. It consists of dual wavelengths (1064 and 532nm) in one system which means it’s safe to treat darker skin types and can treat superficial pigment (epidermal) or deeper pigment (dermal) in the one treatment. IS THE TREATMENT SAFE AND HOW LONG DOES IT TAKE? Utilisation of photomechanical energy rather than photothermal energy (heat) means there is less risk than other lasers. All skin types can be treated with relatively low risk of hypo and hyperpigmentation (lightening or darkening of the skin). The treatment takes around 20-30 minutes to treat a full face. PicoWay Zoom is signigicantly more comfortable compared to other pigment correction devices such as IPL. Utilisation of photomechanical energy compared to photothermal energy (heat) means less heat is delivered to the tissue resulting in a high degree of client comfort. You will feel a ‘prickling’ sensation as the laser passes over the skin. Numbing cream is not required but is available if needed. You will experience slight erythema (redness) for approximately 24-72 hours which is easily coverable with makeup. You may also experience darkening of the pigment in some areas particularly if the ‘zoom’ mode is used. Any part of the body where pigment occurs can be treated. We strongly recommend a thorough skin check is performed prior to having areas such as the arms, hands, face and back treated. The number of treatments required depends on the type of pigment treated. For some pigment types e.g. freckles, brown spots it’s likely you’ll see results after one treatment. For other pigment tpyes such as birth marks, melasma it may take several treatment. Discounts apply when multiple treatments are purchased as a package.